Custom G-Series® Downstack Model GVD721218 features 12 inch diameter top roll and 18 inch diameter center and bottom rolls. 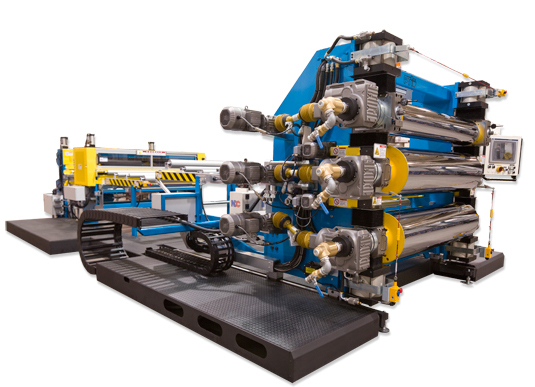 The unit is equipped with individual roll drives, unique telescoping drive shafts for disconnecting and quick roll removal for embossing applications, motorized roll gap and Igus track for accumulating electrical and water lines during roll retraction. 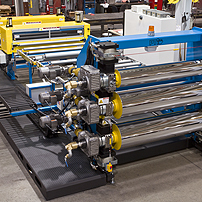 Telescoping Drive shafts for quick disconnect when changing rolls. 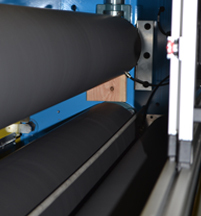 Anti Static Coater for top, bottom or both side applications via transfer rolls.